Summer time at Clara Lake. 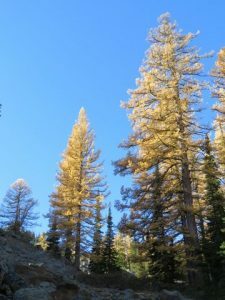 A peaceful, wooded hike that breaks out into an alpine lake basin with beautiful larch glades. The route follows a well-traveled trail through cool, shaded woods. The lake is a good launching point for longer trips in the basin above the lake and to Mission Peak. This is a very easily accessed destination for Wenatchee residents (20 minutes from town) and often a welcomed escape from the summer heat down in the valley floor. The route is well traveled in winter and a week after any storm the trail is likely to be packed out, making travel and route-finding easy. Because the route is usually well packed, is often a nice wintertime hike, even if you don’t own snowshoes. “Hay piles” made by Pica (Small native rabbits) on the rocks above Clara Lake. 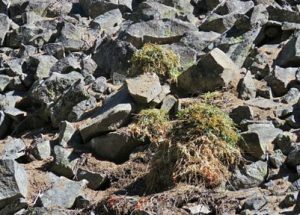 All summer, Pica harvest wildflowers and grasses, dry them in the sun, and then move them to dry storage caves under the rocks so they can feast all winter long under many feet of snow. Maps: See our topo map above (print on 8.5″ X 11″ paper in portrait mode). GPS Info. 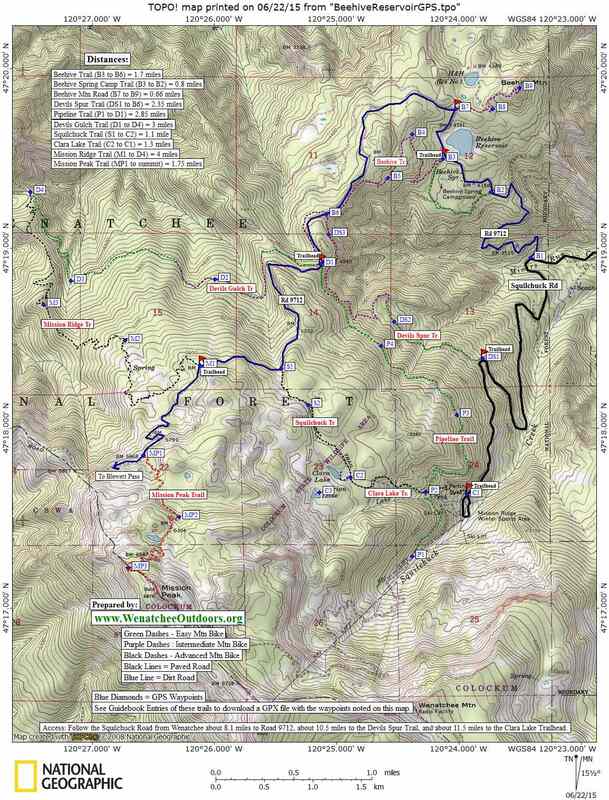 Download this GPX file with the waypoints noted on our map. 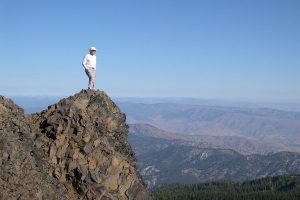 Distance: About 2.8 miles round trip to Clara Lake, or 4.5 miles roundtrip to Viewpoint 6,056’ (see map) or 6.5 to 7 miles roundtrip to Mission Peak. Recommended Season: Clara Lake is nice outing most any time of the year—on foot in summer and fall, on snowshoes or skis in winter and early spring. Access: Drive the Squilchuck Creek Road on the south end of Wenatchee up to the Mission Ridge Ski Area. Park at the end of the parking lot farthest from the lifts (north end) or in the pullouts along the east side of the road just before entering the parking lot. 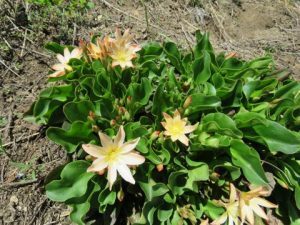 Another lovely spring blooming wildflower seen on the forest floor on the hike to Clara Lake. 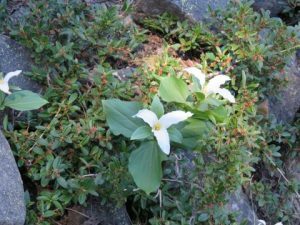 Pacific trillium (Trillium ovatum). takes you Devil’s Gulch in about 2.5 miles). Go straight across the Pipeline Trail and keep climbing. 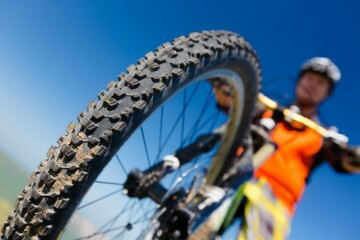 Stay on the trail and, in another 0.75 miles after climbing consistently, you’ll reach the lake. Towering Western larch seen on the rocky slopes above Clara Lake. these places. The terrain beyond the lake is complex and it’s easy to get confused and/or lost if you’re not skilled. See our map for the cross-country routes. Alternate Return. To add 2.75 miles and some new scenery to the return trip, complete this loop. 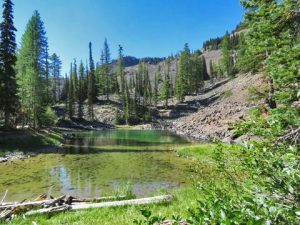 Shortly below Clara Lake, turn north on the Squilchuck Trail and walk 1.5 miles to the Beehive Reservoir Road. Turn right and follow the road 1.25 miles down to the Upper Devils Gulch Trailhead. Across the road from the trailhead, find the Pipeline Trail and follow this 2 miles back to the Clara Lake Trail. Turn left and drop down to the car. Uses Allowed: In winter the lower trail is closed to snowmobiles, snowmobiles are allowed in the basin above the lake and you will see their tracks marking the surrounding slopes. 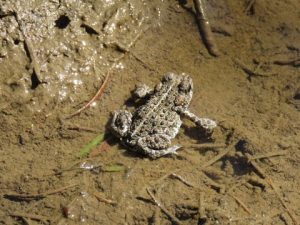 A Western Toad at Clara Lake. Land Designation: This route covers a combination of Forest Service Lands and State wildlife area. boulders on the first 1/4-mile of the trail. Clara Lake guidebook post has been sponsored by the Wenatchee Naturalist Program. 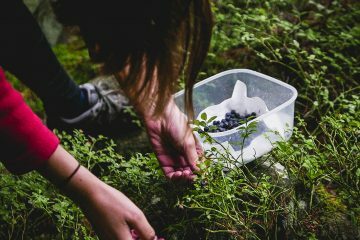 This trail offers a variety of plants and creatures to enjoy and treasure. 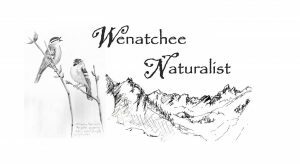 To learn all about our region become a Wenatchee Naturalist.